Boost post doesn’t yield us effective results. It gets us random audience liking our page. We don’t see the right kinda audience interacting with us. We just see them liking our posts but not comment or share. Well, this is a common problem. So, STOP boosting your Facebook post just like that. People who you choose through targeting: It was only possible to target people on the basis of age, gender, location and interest earlier. Now facebook also brings advanced demographic and behaviour based targeting. This results in effective targeting now almost like running your advertisements. You cannot make use of custom audience here, unless you save the custom audience as an advertisement audience. Remember, if you keep a very broad targeting here, you will get a random audience liking your page. People who like your page: This is a great deal provided you have loyal follower base or a huge follower base that you believe has taken genuine interest in your page. Usually, you see less traction with this audience. People who like you page and their friends: If you wish to invite random audience liking your posts, this is the option that you would opt for. I would suggest not to boost your post with this option. Step 1: Post your link and write your content. Ensure that the embedded image doesn’t have more than 20% text. Once you make your post, click on the boost post button. Step 2: Opt for website visits to encourage people to visit your site. Choose your call to action button and boost your post for at-least 1$. You can choose an audience of your choice or boost it to your followers (in-specific). Step 3: Once you boost your post for a minimum amount you would notice the following, a ‘call to action button’ and the amount you have spent. Now, regardless of your post continues to boost or not, this call to action remains here. Step 4: Log on to www.facebook.com/ads, create your advert and choose Website Traffic as your objective. This is to drive traffic to your landing page. Step 5: Choose Your Audience. If you are opting for a fresh audience you can choose from demographic, interest and behavior basis. If you are opting for custom audience you can pick all the audience that you have created using above methods. Give your audience a name that you can identify. Don’t forget to save your audience for later use. Pick These Options. People Who Have Watched Your Videos (10% to 95%), People who have interacted with your Lead Generation Forms, Audience who have interacted with your. Events, Pages, Instagram Business Profiles. Step 6: Optimize For Landing Page Views instead of link clicks as this will help you to reach out to those people who are more likely to spend time on your landing page. Step 7: Facebook will ask you if would like to drive traffic to messenger, website or use an existing post. 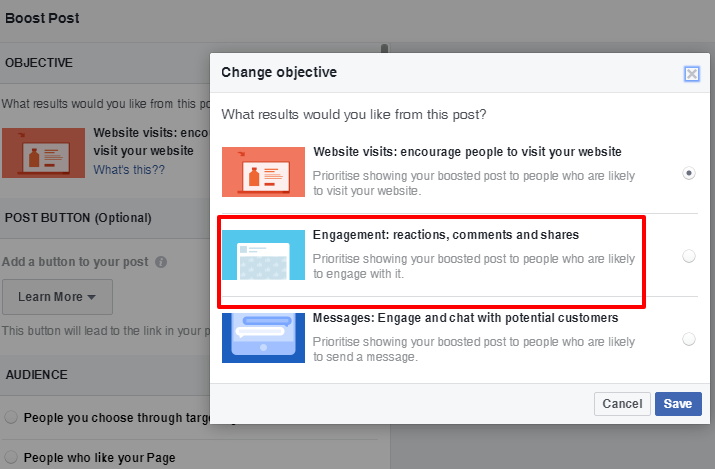 Opt for existing post and choose the link that you have shared as a Facebook post. I’ve covered all that I’ve tried and tested with the boost post option in this article. Share your thoughts in the comments section! NIce guide. I will definitely try according to your guide line. Your tips are worth implementing. Thanks for your stepwise guidelines. Hi Sorav, gone through your “FB boost post to drive traffic” and really agreed on the steps you have shared. Usually i have seen that the users are eager to boost their posts without seeing any engagements. They think if we boost more posts we get more traffic & engagement. But, i also have realized that the process you have stated works best for a business to drive more traffic.